Thank you for your interest, look forward to hearing from you soon. Monday – Friday , 7 a.m.- 6p.m. 32.5 & it's the 2nd Driveway. 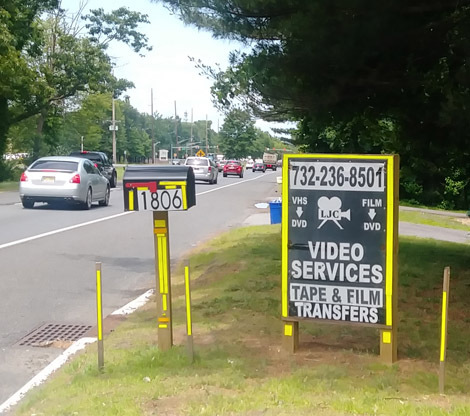 LJC Video Services sign is on the shoulder of route 18.
there's a bunch of Yellow reflectors all over the place. Just pull in the driveway. If you go too fast you'll have to make a U-turn again. Go over Bridge will be on route 35/Route 9 South. you see Ferry Road right before the traffic light turn there.